UFO SIGHTINGS DAILY: UFO Shoots Out of UFO Shaped Cloud In Arizona On Dec 2016, Video, UFO Sighting News. UFO Shoots Out of UFO Shaped Cloud In Arizona On Dec 2016, Video, UFO Sighting News. 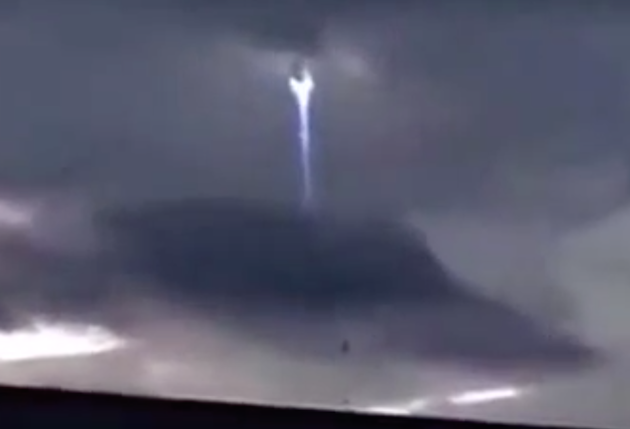 In this video, we see a bright light shooting upward into the clouds from a UFO disk dark cloud. Arizona is a famous hotspot for UFOs and alien bases, so its nice to get this substantial evidence of their existence in that area. This is an alien ship, shooting off through the clouds, leaving earth. It almost looks like a meteorite, but its not falling, its going up! Did you notice that the cloud the UFO comes from looks like a giant disk cloud? UFO VIDEO HAS BEEN DELETED FOR UNKNOWN REASON.